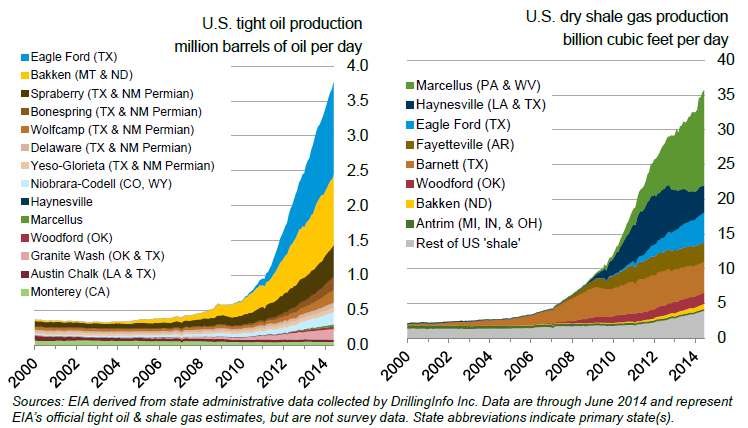 How Fracking Saved the U.S. Economy – CB Capital Research, Inc. The modern economy is a function of cheap, easily-accessible energy sources. The modern transportation, technology, healthcare, and agricultural industries cannot function without a cheap and reliable source of energy–in fact, our survival depends upon it. Beginning with the Industrial Revolution, the vast majority of U.S. economic growth was predicated on an exponential increase in energy consumption. This demand was met by the growth in global energy supplies, the rise of natural gas as a fuel source during the 1970s, and now alternative energy sources such as solar, wind, and biofuels. Surprisingly, efficiency breakthroughs did little to counteract the insatiable demand for new sources of energy (e.g. each die shrink in the modern-day CPU created even more demand for computers and computing power). This means that future U.S. and global economic growth can only be guaranteed through new sources of energy–i.e. greater efficiency and recycling can only achieve so much. Since 2012, we have argued for a “U.S. Energy Renaissance” through the advent of hydraulic fracturing (“fracking”), horizontal drilling, ultra deepwater drilling in the Gulf of Mexico, as well as the commercialization of alternative energy solutions and more efficient battery storage. Recent evidence suggests our thesis continues to be true. In fact, the latest energy (especially crude oil) production statistics show that tight oil production (through fracking in shale fields such as Eagle Ford (TX), the Bakken (MY & ND), Spraberry (TX & NM Permian), Bonespring (TX & NM Permian), Marcellus (PA & WV), etc.) is still hitting record highs, surpassing many analysts’ expectations. As recent as October 2012, the Energy Information Administration (EIA) projected U.S. crude oil production to rise from 6 million barrels/day to just 7 million barrels/day by 2020 in its base case. 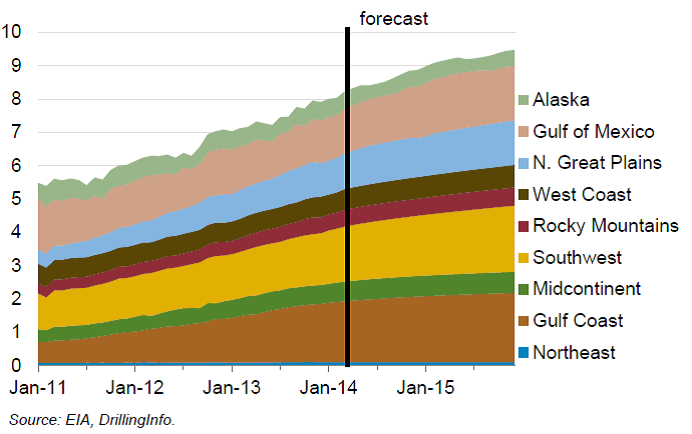 Only in its most optimistic scenario did the EIA project U.S. oil production to hit 8 million barrels/day by 2020. Shale oil production, however, has surpassed even the most optimistic projections from just 20 months ago. Today, U.S. crude oil production has already surpassed 8 million barrels/day (8.3 million barrels/day during May 2014), and is now projected to rise above 9 million barrels/day by the end of 2015–close to the record high of 9.6 million barrels/day production in 1970. We contend that the tremendous increase in U.S. oil and gas production over the last several years has single-handedly saved the U.S. economy and employment picture from a potentially catastrophic outcome. According to the EIA, the U.S. trade deficit resulting from oil imports reached a record high of $452 billion during the third quarter of 2008 as the spot price soared to nearly $150 a barrel. 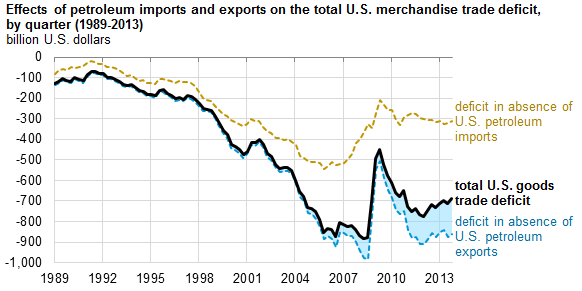 As recent as the second quarter of 2011, the U.S. oil trade deficit sat at $346 billion. As of the end of 2013, the oil trade deficit has shrunk to $203 billion and is projected to shrink to less than $170 billion by the end of this year. This shrinkage in the U.S. oil trade deficit added a full percentage point to U.S. GDP (as well as added a record number of jobs in Texas and North Dakota), but more important, helped secure U.S. energy and national security for years to come. Paradoxically–as U.S. reliance on foreign oil supplies dwindles–we expect foreign oil production growth to exceed current expectations, Iraq’s geopolitical turmoil notwithstanding. As oil prices rose from <$40 a barrel over the last decade, many countries such as Russia and Mexico have resorted to a parasitic policy of resource protectionism to maintain national control over its oil supply/infrastructure. This has resulted in anemic global production growth at best, as many oil-exporting countries had no incentive to invest in future oil production growth given the rise in oil prices every year. The decline in Petroleos Mexicanos’ (Pemex’s) production due to the lack of R&D and capital expenditure spending is a prime example. Just last week, Pemex lowered its 2014 production forecast from 2.5 million to 2.41 million barrels/day, its lowest in at least 24 years. As long as oil prices were rising, the Mexican government did not have much incentive to invest in future oil production growth. Now that global oil prices are expected to remain flat over the next 5-10 years (due to the ongoing shale revolution), the Mexican government has no choice but to execute a 180-degree turnaround to compete for global oil market share. For the first time since 1938, the Mexican government has invited foreign capital back into its oil industry; consensus expects this landmark law to bring in $50 billion of annual foreign private investment by 2020 (as a comparison, Pemex’s 2015 capital expenditure budget is estimated to be $29 billion, up from $27.7 billion this year). Going forward, we expect global oil production growth to exceed expectations–thanks to the direct and knock-on effects of the U.S. fracking revolution.